Today I was able to get the driver's side floor installed. After that, I assembled the driver's side foot box to check fitment. I'll have to trim a bit off the lower inside foot box panel, but everything else looks like a good fit. I also drilled the hole for my separated brake hoses. I also adjusted my Wilwood balance bar to get the brake pedal off the cross brace. I had to shorten the push rods a bit as discussed in several threads, but I think I have it correct now. Last edited by Papa; 04-22-2018 at 12:50 PM. Also, consider leaving the outer parts of the driver's foot box off of the car until you get through your Go-Kart testing. That way you can get to the tough stuff if you need to do some adjusting or fiddle with the pedal assembly, wiring harness, etc. Thanks, Steve. I'll definitely leave the outer sections off. I just wanted to fit everything before I mounted the inner wall. I wish I'd done the fitting before mounting the Wilwood front panel as you can see it sits about 1/8" lower than I'd like. Had I done a complete fitting first, I would have trimmed a bit out of the rectangular slot to get the panel to sit a bit higher. Last edited by Papa; 07-23-2017 at 10:36 AM. I finished installing the inner wall on the driver's side foot box today. After that, I fabricated a bracket for my CNC double reservoir. I think it turned out pretty good. I'll mount it from the bottom of the curved tubing just to the front of the foot box. To make the bracket, I cut a section of the unused front foot box panel and then added nut-serts so that I can remove the reservoir if I ever need to someday. I also replaced the fuel tank strap hardware with stainless. Last edited by Papa; 04-22-2018 at 12:52 PM. I stayed home from work today to meet a contractor and to take delivery of my wheels and tires. I finished up the cockpit aluminum except for the rear wall as I need to get the trunk floor in before attaching the rear wall. I also spent a little time getting the driver's foot box access cover set up with nutserts. When the wheels and tires showed up, I had to give the FedEx guy a tour around the chassis. He was in awe with the kit. I went ahead and mounted up one each front and rear tire to check fitment and they fit, but just barely! 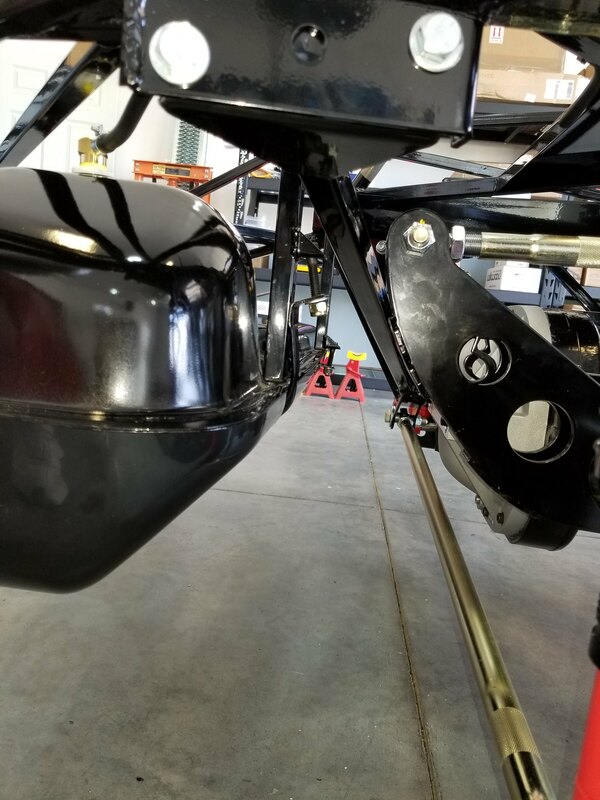 The lower traction lock bracket is about 1/4" from the inner edge of the rim and the top of the tire clears the coil spring by about 1/2". The fronts fit fine with maybe 1/16" clearance to the brake caliper. She's starting to look like a car! Last edited by Papa; 04-22-2018 at 12:56 PM. I installed the steering rack and shaft today. When I installed the shaft onto the rack, the rack's splined shaft bottomed out into the lower steering shaft, but left some splines showing. I assume this is normal? Last edited by Papa; 04-22-2018 at 12:58 PM. Looking really good! Steering shaft appears to be normal. Exactly how my steering shaft looks as well. Thanks, guys. I appreciate the comments and confirmation on the steering. You sure manage to keep your shop nice and tidy, during the build..
Hope you don't mind if I throw in a couple comments.. I was looking at the strap bolt on the picture you posted, and it looked to me like the nylock nut should have a few more threads holding it in place.. I purchased a longer bolt specifically for that spot, because of that. Today I assembled the fuel tank and installed it. Thanks to some gentle nudges from the gurus, everything fits well and is solid after bending the flange flat on the four parts of the tank where the frame comes in contact with it. You mention attaching your trunk floor panel. I would be hesitant to install that, until you get your brake and fuel lines all in place. It's a lot easier to drill holes in the frame for the line clamps from above. That being said, I also left my floor panels free until all the lines, and electrical harness was installed. Outer foot box panels, were also left till later in the build, as it allowed for easier access to wire harness, and ECM installation and fitting insulation and carpet in the foot box area. I also noticed the angle the throttle cable sits on when attached to the pedal, as it passes through the threaded ferrule in the foot box front panel. I have heard of that cable sawing itself into the ferrule after a time. It can cause the cable to eventually fail from friction fatigue, or even possibly cause the cable to jam in the groove cut in the ferrule. One of the ways you might be able to avoid this issue, is similar to what I have seen some builders, do when they had a similar issue with the clutch cable, and firewall adjusters. Simple tube shims, cut at an angle, and installed behind the ferrule nuts, will allow the cable to move back and forth through the ferrule, without cutting in to it. The shims center the cable angle, by making the ferrule sit at a slight angle. At the very least make sure you grease the cable well where it will move through the ferrule. There may be some other solutions builder have come up with, that they could offer, to avoid this potential issue. I appreciate any and all comments as I am a first-time builder and can use all the tips and hints I can get. I spend a ton of time reading through the other build threads before every step. I used to work in my Dad's body shop when I was a kid, and he always stressed keeping things clean and organized -- I guess that stuck with me. The bolt on the passenger fuel strap is still loose (the manual said to leave it that way for now -- not sure why) and I bought some aluminum tubing to make spacers with that I'll use to try to get the bolt a bit straighter when I do fully tighten it up. I'll shim the ferule for the throttle cable. I don't think it needs much, but better to address it before it turns into a problem. I have a box of thin stainless washers that I think I can use to make shims if I cut one or two in half and file the edges down. I'll play with that this weekend. I won't be installing the trunk floor until after I run my brake and fuel lines. I just wanted to get it fit for the battery box and don't have my Ni-Cop brake line yet. I want to run my brake lines with as few unions as possible. I ordered an Eastwood line straightener and a roll of Nickle-Copper line with stainless gravel-guard and a bunch of fittings. I also have the Eastwood turret style professional flare tool and bending pliers. Once the lines are all run and I have my electrical harness positioned, I will get the trunk floor in and then attach the rear cockpit wall. I was more concerned about the fluid lines and hadn't considered the electrical, so thanks for bringing that up! I will be getting the chassis off the dolly soon now that my steering parts and wheels and tires came in. I'll be setting the car on a set of skates for the rest of the build, but can put it up on jack stands if I need more room to work under the car. Thanks again for taking the time to share your experience with a rookie builder. I truly appreciate all the help I can get along the way! Last edited by Papa; 07-29-2017 at 09:33 AM. Dave, are these the Eastwood bending Pliers you got? If so, please test them on NiCopp lines. I did the same thing and there's an edge on those pliers that leaves a really nice little nick in the line. Excellent spot for a crack and a broken line later on. I was going to use them for fine tuning the lines, but ended up tossing them in the toolbox and didnt touch em again. Might work well on harder lines, but the NiCopp is just too soft. The line straighteners and turret flaring tool will work great. You can do slight bends with your hands to fine tune. If you do single flare with the turret tool, like an AN fuel line, research how to do it. Directions are all about double flare. Does excellent single flares, you just gotta know how first. Yep -- I bought the flare tool and pliers as a combo set from Jeggs. Thanks for the heads up on the potential to damage the line. I was considering getting an actual tubing bender to get tighter radius bends without kinking the line. I watched Eastwood's video on their site on how to make different types of flares and it does a nice job showing how to use the tool. I'll do a bit of practicing before I get serious with my lines that will go onto the car. I found this tubing bender worked fine for all bends other than the pig-tails. I used armored lines, so I needed a bender that would accommodate a larger diameter. For the pig-tails, I used the two sockets in a vice method. Def use a tubing bender. Makes nice curves and a neat job. I picked up this bender from AMAZON and used it for everything. Also, I did run all of my tubing (Brakes & Fuel) along with the rear wiring harness before installing the trunk floor. I ordered one very similar to that and it should be here in a couple of days. I had planned to start running my brake lines today, but I'm still missing a few things for that task. So, I mounted the reservoir and connected the master cylinders with the CNC supplied hoses. Then I did some testing to see how much movement of the rear axle would be required to contact the FF Metal battery box and decided that if I actually articulated the rear axle as much on either side to cause contact that I'd likely be in much worse trouble with the car than a dent in the battery box. So, with that said I went ahead and mounted the box and cut out the opening in the trunk floor. That's all I had in me today. Last edited by Papa; 04-22-2018 at 01:01 PM. I got a little more done today while I wait for the rest of my items to arrive so I can start running my brake hard lines. Here is another picture of the FF Metal battery box all painted and fully riveted. I also installed cushion clamps on the brake reservoir hoses. I still need to finish adjusting the balance bar before locking down the jam nuts and calling it good. I also installed all the brake flex lines and checked for clearance with the front wheel mounted and turned lock-to-lock. Last edited by Papa; 04-22-2018 at 01:04 PM. Very Clean & Very Professional! A Masterpiece Is Being Created! Thanks, Steve. And thank you for all the hints and tips you've been sharing. My two cents on the cover... I like the cast cover idea too... and if you had to have it all "chromie" (new word) you could always polish the cast cover. No "chromie" cover for me! I treated the cast cover with Sharkhide and did the same for all the bare metal parts in the suspension as well. BTW, I grew up in Lodi, CA. ; just a few hours north of you. Actually 3 and 1/2 hours lol My wife's (of 35 years next month) lives in Aurora. Your build looks and is going great! Keep up the good work! All of these guys on here are an incredible, priceless wealth of knowledge. I'm envious for now, but should place order before the end of the year. The last two items I needed to start my hard brake lines arrived today. I think I have everything I need now. My first test flare looks good to me. Last edited by Papa; 04-22-2018 at 01:05 PM. Isn't that the coolest, easiest flaring tool you've ever seen? Take your wife out to dinner and start doing brake lines this weekend. Just remember when form follows function, then all is right with the world. Last edited by GoDadGo; 08-02-2017 at 07:41 PM. It's pretty idiot proof, which is exactly what I need! The tubing straightener is amazingly simple and effective as well. The only negative is that it only works on one size of tubing and the price is a bit steep for what it is. Friday is date night with the wife -- Saturday is brake line time! I wish I would have bought the straightener. While I was waiting for my brake line items to arrive, I started looking at the dash. I assembled the glove box and didn't care for the latch that came with the kit. It looked fine, but I didn't want to have to use a key to open the glove compartment. Thanks to Paul (edwardb) for recommending the VW latch. The latch looks great and allows the door to be locked or unlocked and opened without a key. The catch that came with the dash is too small to allow the latch to grab it, so I'm making a catch bar. I cut and bent a piece of 8-32 threaded rod and I'm filing the threads off the portion that will be used as the catch. It will be adjustable using the small nuts and secured from the opposite side with to locking nuts. Last edited by Papa; 04-22-2018 at 01:07 PM. My first hard line is in place. It's the tie between the two rear wheels. I need to finish installing the cushion clamps. I'll be running the long line from the rear to the master cylinder next. That may prove a bit more challenging. It's a good thing the rolls of nickel-copper aren't too expensive. Last edited by Papa; 04-22-2018 at 01:09 PM. Check Edwardb's build threads before you start the long run or send him a Private Message because I'll bet he has some slick tricks. I have his brake line post printed out and sitting in front of me! Now I just need to figure out if I can do the rear to front in one continuous piece with out a lift to get the car high enough to run the bent line into the foot box. I may end up with a union inside the foot box, which is probably okay. I had to do a union under the driver side foot box. I did the union outside the car in case I had a leak. That's pretty much what I'm looking now. I just want to be sure before I start drilling holes. Rear brake hardline is complete! I had to use one union. Last edited by Papa; 04-22-2018 at 01:12 PM. Rear brakes line installation as described in the manual. good job. I did the exact same route. It is quite common to need one union. Are you contemplating the installation of self adhesive sound/heat deadening material such as Dynamat? If you are, consider starting to install in the ends of the footboxes before closing them up. It is a pain to stick that stuff in those areas once closed and the body is on. Thanks, Dave. I wasn't sure about using the gravel guard on the full length of the line, but I figured it couldn't hurt anything, especially using the softer nickel-copper line. I plan to get started on the front today, but I think I may run out of line before finishing. I do plan to install Thermo-Tec mat on the floor and cockpit walls, so that will be one of the next tasks I start on. Should I seal up all the gaps with silicone before placing the mat? It seems like I should, but haven't seen much discussion on the topic. Thinking about places for water to drain when the inevitable happens.